In contrast to virgin coconut oil, coconut oil comes from coconut meat/flesh that has been dried out either by exposure to extended sunlight or by direct heating. This produces a substance popularly referred to as Copra or dried coconut flesh. Copra is then pressed or dissolved with solvents to produce coconut oil. In contrast with virgin coconut oil, the coconut used to make coconut oil are not necessarily fresh and may have been laying around for days or months before being sent for processing at copra mills. Despite its very high saturated fatty acid content, coconut oil has a number of proven health benefits and does not appear to confer any increased risk of heart disease. One of the most powerful studies to initially prove this involved a landmark study published in 1981 in the prestigious American Journal of Clinical Nutrition. The study involved an extensive dietary analysis of two populations (i.e. Tokelauans & Pukapukans) of Polynesians, who had habitual diets high in saturated fat but low in cholesterol and sucrose1. The study was extraordinary in that dietary records of every individual in both populations (i.e. 796 for Pukapukans & 1792 for Tokelauans) were examined. In both populations, coconuts were the chief source of energy, with the Tokelauans deriving 63% of their energy from coconuts, while the Pukapukans derived 34%. Despite the high intake of saturated fat in both populations, cardiovascular disease was virtually absent1. The health benefits of coconut oil are thought to be conferred largely by its high content of medium chain triglycerides (MCTs). Unlike the more common long chain fatty acids found in vegetable oils like olive, sunflower and canola, MCTs are absorbed and travel directly to the liver where they are preferentially burned for energy. This is in contrast to long-chain fatty acids that are metabolised through the lymphatic system. Many of the proposed benefits of coconut oil come from benefits inferred by studies of MCT supplements. An important distinction to make, however, is that coconut tends to be high in lauric acid – a 12-carbon medium chain fatty acid, which is typically not high in most commercial MCT preparations. What’s more lauric acid itself is believed to confer its own health benefits. So it’s hard to draw direct links between the benefits of MCT supplementation and coconut oil. Studies have shown that lauric acid has antimicrobial properties against gram-positive organisms2 such as the bacteria Staphylococcus Aureus3 and the yeast Candida Albicans4, a common source of yeast infections in humans. 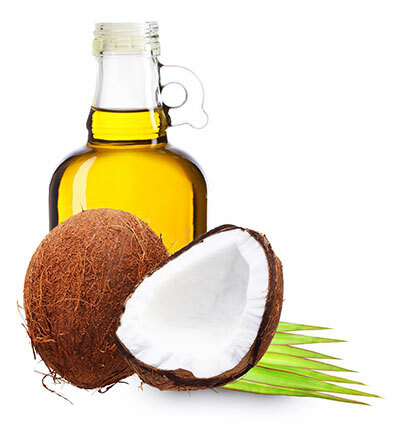 While a number of studies in rats using virgin coconut oil have suggested in can improve cardiovascular risk facts, there is one study in 40 women, where coconut oil supplementation for 1 week combined with daily waking and a reduced carbohydrate intake led to reduced total and LDL cholesterol while increasing HDL compared to soybean oil9. A number of studies have explored the effects of coconut oil or medium chain triglycerides supplementation on performance of endurance athletes with mixed results1-3. However, a study by Japanese researchers published in 2008 showed ingesting small amounts (6g) of medium chain triglycerides during exercise for two weeks resulted in lower blood lactate and rating of perceived exertion in cyclists compared with a long-chain fatty acid supplement4. The ambiguity in results between studies may have something to do with length of supplementation, suggesting that the body may respond to coconut oil supplementation over time by increasing its level of fat oxidation. The most common negative reported side effect is nausea. While it is unclear what the exact mechanism is, some suggests it may be specific medium chain fatty acids, while others suggest it may be other ‘non-fatty acid’ components in coconut oil. On its own, coconut oil is typically used in doses of 5-15ml. Oral doses above this have a tendency to produce gastrointestinal upset in a number of individuals due to the high medium chain triglyceride content, but there seems to be a large individual variance in tolerance. Larger doses of coconut oil are commonly used in cooking, where it can be diluted with other ingredients. Coconut Oil supplements are increasing in popularity with new brands popping up all the time. Coconut oil can be bought as organic or non-organic, with some supplements advertising themselves as cold pressed or refined. Because of their high fatty acid content, it is common for coconut oil to solidify at temperatures below 25oC, but it can quickly be turned back into liquid with gentle heating. 1. Prior IA, et al. Cholesterol, coconuts and diet on Polynesian atolls: a natural experiment: the Pukapuka and Tokelau Island studies. The American Journal of Clinical Nutrition. 1981;34:1552-1561. 2. Kabara JJ, et al. Fatty acids and derivatives as antimicrobial agents. Antimicrob Agents Chemother. 1972 July; 2(1): 23–28. 3. Ruzin A & Novick RP. Equivalence of lauric acid and glycerol monolaurate as inhibitors of signal transduction in Staphylococcus aureus. J Bacteriol. 2000;182(9):2668-2671. 4. Ogbolu DO, et al. In vitro antimicrobial properties of coconut oil on Candida species in Ibadan, Nigeria. J Med Food. 2007;10(2):384-387. 5. Goedecke JH, et al. Effects of medium-chain triaclyglycerol ingested with carbohydrate on metabolism and exercise performance. Int J Sport Nutr. 1999;9(1):35-47. 6. Jeukendrup AE, et al. Effect of medium-chain triacylglycerol and carbohydrate ingestion during exercise on substrate utilization and subsequent cycling performance. Am J Clin Nutr. 1998;67:397–404. 7. Horowitz JF, et al. Pre-exercise medium-chain triglyceride ingestion does not alter muscle glycogen use during exercise. J Appl Physiol.2000;88:219–225. 8. Nosaka N, et al. Effect of ingestion of medium-chain triacylglycerols on moderate and high-intensity exercise in recreational athletes. J Nutr Sci Vitaminol. 2009;55:120-125. 9. Assunção ML, et al. Effects of dietary coconut oil on the biochemical and anthropometric profiles of women presenting abdominal obesity. Lipids. 2009;44(7):593-601.